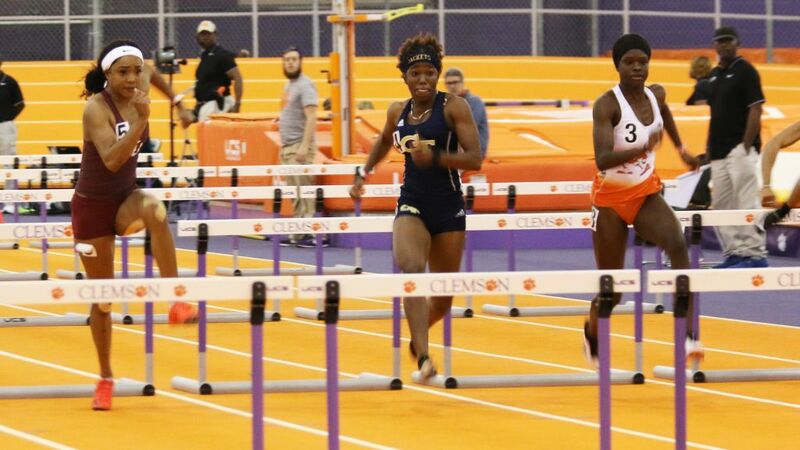 CLEMSON, S.C. – Sophomore Ka’Tia Seymour delivered Florida State its lone victory Friday at the Tiger Paw Invitational and she did it in a style on the same track where she won last year’s MVP track performer honors at the ACC Indoor Championships. Seymour burst from the blocks and finished through the line in the 60-meter dash finals in a personal-best time of 7.21, which was not only good for her first collegiate win in the shortest sprint, but also locked up a spot in next month’s NCAA Indoor Championships. Sophomore teammate Jayla Kirkland’s season-best time of 7.25 was good for third and virtually assures a return trip to the NCAA Championships. They closed the day ranked sixth and ninth nationally in their chase to land one of 16 qualifying spots for the March 8-9 championship meet in Birmingham, Ala.
As it should. Seymour moved into sole possession of third place on FSU’s all-time list at 60 meters behind Tonya Carter (7.15) and Michelle Finn (7.19), who own NCAA titles. The duo will team up again in the Invitational section of the 200-meter dash, hoping of locking down NCAA qualifying spots in that event as well. Seymour’s 22.85 at Clemson for the 2018 ACC title is the second-fastest at the facility. FSU’s hurdle stars Cortney Jones and Trey Cunningham put together impressive runs to the 60-meter hurdle finals and came up just short, registering runner-up finishes. Jones’ season-best time of 8.07 sealed her return trip to the NCAA Indoor Championships, where she was fourth last season, but wasn’t quite good enough to get past Miami sophomore Tiara McMinn (8.06). Jones ran 8.17 in the semifinals, where teammates Ashley Miller matched her personal-best (8.24) to also move on to the final. A slow start out of blocks – a product of a little rust after a couple weeks of cross-training – resulted in a deficit the Conyers, Ga. native could not quite overcome with her fast finish. Miller finished sixth (8.27). Cunningham’s second-place finish was also the result of a slow start from the blocks, but he did close in 7.58 to back up his 7.59 from the semifinals. Kentucky’s Daniel Roberts won in 7.53, which nudged Cunningham to No. 3 on the national qualifying list. • Freshman DaeQwan Butler’s indoor 400-meter personal-best of 47.95 was good for a seventh-place finish and ranks eighth on the ACC descending order list. Florida State senior Militsa Mircheva returned to Boston University’s launch pad of an indoor track Friday and promptly dropped the No. 2 3000-meter time in school history. 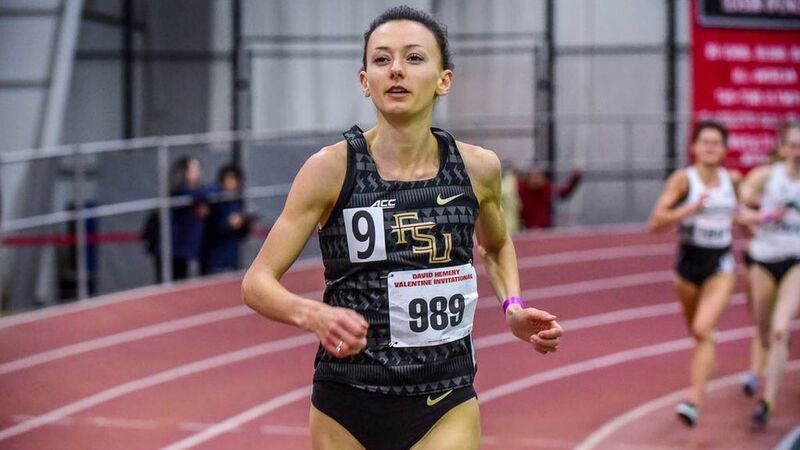 Racing against a field comprised almost entirely of post-collegians, Mircheva ran 9:07.33, a 15-second personal-best that trails only former Seminole great and NCAA champion Susan Kuijken (8:56.27). The Bulgaria native and 2016 Olympic marathoner moved to No. 15 on the national descending order list. Her performance trumped that of teammate Maudie Skyring, whose 4:40.17 mile – a five-second personal-best – was 10th fastest out of more than 200 runners and third-fastest among collegians. “They both came to run fast and were determined to do that from the time the gun went off,” FSU women’s distance coach Kelly Phillips said. “Militsa had some fun and the end of her race…She kicked people down. Worth noting, Mircheva set the FSU 5000-meter record (15:43.30) back in December on the same track. Among other notable performances Friday from the FSU women in Boston were Addison Coggins’ 17:05.07 5000-meter debut on the track indoors, and Madison Harris’ season-best 2:10.21. The FSU men will take center stage Saturday at Boston’s David Hemery Valentine Invitational. Graduate transfer Rougui Sow got off to a slow start in the invitational section of the women’s long jump Friday at the Tyson Invitational, but her strong finish made it worth the wait. The two-time All-American as an undergraduate at South Carolina came up with big improvements on her fifth and sixth attempts in the finals to secure a runner-up finish with a top mark of 6.40 meters (21-0) to overhaul and edge Florida’s Yanis David, the NCAA leader in the event. Sow moved into second place with a fifth-round leap of 6.29, then sealed her runner-up finish with the 6.40 on her final attempt. Ketura Orji, the 2018 NCAA Indoor champion now competing as a professional, took the victory with a mark of 6.51 meters (21-4.25). Armani Wallace finished seventh in the invitational men’s long jump with a season-best mark of 7.42 meters (24-4), while sophomore Jacore Irving’s personal-best of 7.26 meters (23-10) was good for fifth place in the open section. You can follow the Noles throughout all three meets via Twitter on Saturday @FSU_Track.